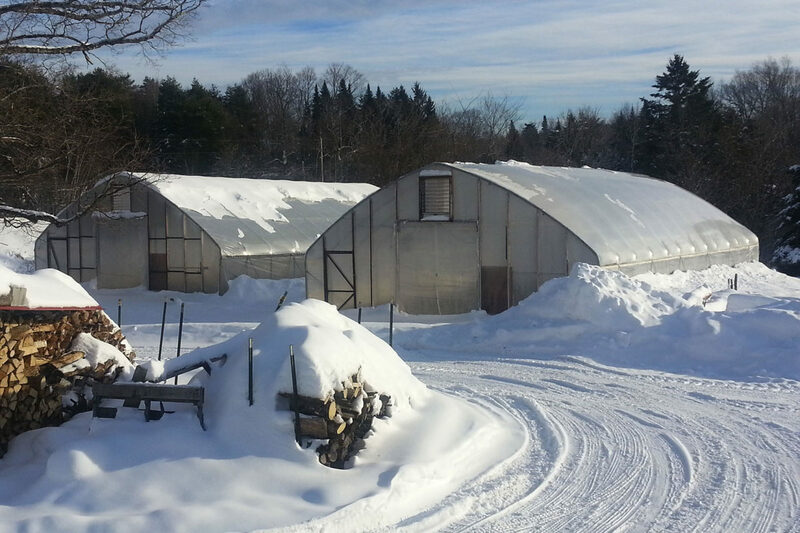 New technology—and growing demand for local food—is making winter farming more possible than ever. Farmers are finding ways to grow vegetables during the cold months, and they’re doing so with large unheated hoophouses, heated greenhouses, or small “low tunnels.” These structures provide farmers with an attractive environment protected from snow, frost, wind, and excess rain, and allow the grower to control the humidity, moisture, and temperature. And from 2007 to 2012 alone, when the last farm census was done, production of vegetables in greenhouse structures increased from 1,417 acres to 2,249 acres—an over 60 percent increase in just five years. Why the uptick? From an industry that is likely to be worth over $20 billion by 2019, customers are increasingly seeking out local food—presumably even in winter—so demand is part of it. Another reason for this leap is the U.S. Department of Agriculture’s (USDA) National Resource Conservation Service (NRCS), which began a program in 2010 dedicated to funding high tunnel projects for farmers. Since then, the NRCS has helped fund over 13,000 hoop houses or similar structures. That certainly helps. But there is also another significant driving factor inspiring farmers to brave the cold and grow more food. The technology of winter farming has simply come a long way. The first known greenhouses were designed by the Roman Emperor Tiberius (42 BC – 37 AD), explains John Perlin, author of Let it Shine: The 6,000 Year History of Solar Energy. Tiberius had “a penchant for cucumbers,” says Perlin, and had special carts of soil built to be wheeled into the sun and covered to retain the heat, keeping his cucumber plants producing through winter. Although the use of glass in winter agriculture more or less disappeared through the Middle Ages, interest in covered growing spaces rebounded around the 15th Century. As glass making techniques improved, the technology eventually trickled down to small farmers. As Eliot Coleman describes in The Winter Harvest Handbook, 19th Century Parisian market gardeners used thousands of large glass jars called cloches like miniature greenhouses to cover plants as they grew. These growers would also employ cold frames—shallow, covered boxes—sitting atop piles of decomposing horse manure. The natural heat from decomposition provided the plants with added warmth in the colder months. This type of growing, though effective, was severely labor intensive. And covering large spaces with glass panes was simply beyond the budget of most small farmers. So although many elaborate greenhouses were built from the 15th Century to the early 20th Century, most weren’t within reach of the average grower. Indeed, everything about winter production changed when polyethylene plastic came along. By the 1960s plastic for greenhouses was widely available. Labor went down, so the profitability of winter farming went up. However, while these large plastic structures solved certain problems, they created new ones. What most greenhouses do if left unmanaged is not create a perfect microclimate; rather they create a desert. They concentrate heat while preventing moisture from penetrating, so although this covering helps protect from wind, snow, and excess rain, irrigation becomes essential. Once you bring water into these houses, however, you create humidity, excesses of which can lead to fungal diseases on your crops. Sealing out the wind also seals out the airflow, further adding to disease susceptibility, damaging pollination, and encouraging pest problems like aphids. Then, of course, you still have to worry about extreme cold killing your plants. Add to these problems the fairly prohibitive cost of building the structure itself, and it just wasn’t worth it for most farmers to expend the energy to grow food in winter. “Protected culture,” as it’s often referred to, didn’t yet have the wings it needed to take off. Then, late in the last century, things started to change. Growers persisted, government agencies and universities programs worked hard to unearth new information, paving the way for a dramatic uptick in farmers growing under cover. Books were written, designs were revised, and technology rose to meet the needs of winter farmers. Now, protected culture is a much different, and more approachable, story. First, the tunnels themselves are more affordable. One can get online and order a pre-fab high tunnel structure delivered straight to the farm that can be easily assembled by anyone with a shovel and basic tools. In a few days or weeks, you can have a covered plot of soil. It’s “a far cry,” says Andrew Mefferd, from how greenhouse growing was even just 30 or 40 years ago when structures had to be perfectly level for carpenters to place large panes of glass or hard plastic. The improvements in the flexible plastic itself, sometimes called greenhouse film, has likewise been crucial to the shift. Not only is the plastic now made to resist degradation from ultraviolet radiation, but many films now contain anti-condensation coatings that help spread the water out, encouraging better light penetration while preventing drips. Manufacturers, says Mefferd, have also started to manipulate the film technology to take better advantage of the greenhouse effect, allowing more light to come in but less heat to escape. One plastic technology that has receiving a lot of buzz is SolaWrap. “It’s like a bubble wrap for your greenhouse,” explains Michael Kilpatrick, of In The Field Consultants, “It’s more expensive, but it lasts 20 to 30 years, and you should never have to replace it in your lifetime.” Contrast that with the polyethylene of the last few decades which can cost a few hundred dollars every few years, and you can understand the appeal. The Internet of Things has not left behind the greenhouse grower. Consultants like Kilpatrick point to products like Monnit and Raspberry Pi Vivarium, which enable the grower to remotely monitor elements such as humidity and temperature from their homes or via cell phones. The tunnels themselves are also becoming smarter, and many things like ventilation and irrigation can be automated or even controlled remotely with products such as Link4 Corp’s iGrow, which allows farmers not to have to travel to the structure for every small task, saving them time, energy, frozen fingers, and, ultimately, money. For farmers in colder climates concerned about the cost of heating—literal or environmental—much attention has likewise been paid to making heaters more efficient, and the tunnels themselves better at retaining heat. One innovative example is the climate battery. In the warmer months, when temperatures are up, fans push excess heat down into piping below the soil for storage. This heat is then released slowly over the winter, helping to regulate temperatures aboveground and keep plants growing. Image from The Greenhouse and Hoophouse Grower’s Handbook, courtesy of Chelsea Green. Of course, the DIY spirit has a role in farming that no technology will ever fully supplant. So where industry, university, or government support hasn’t satisfied farmers, they’ve often made their own way. Pipe benders for instance, have made it possible for farmers to create small, makeshift tunnels—called low tunnels, caterpillar tunnels, or hoop houses—anywhere they need them, at any size. Small plots or even single beds can be quickly covered, allowing farmers to maintain healthy crop rotations, and cover plantings on the fly. Wolfe’s Neck Farm in central Maine provides another good DIY example. Their Teen Ag Program, which works to teach local teenagers about organic agriculture, recently decided to repurpose an old high tunnel in lieu of buying a new one. Richard Hodges, who runs the program, describes how although mobile high tunnel designs exist for sale, they decided to hire an engineer to create exactly the tunnel they needed. The engineer added bracing to the frame and made the structure mobile by putting it on wheels. “And the product is pretty amazing,” says Hodges. The Teen Ag Program is now able to extend the seasons on two different crop plantings simultaneously. One more tender selection of crops goes inside the tunnel, while a hardier one is planted in the open. Then, before the colder weather sets in, they jack the tunnel up and roll it over the second planting with just a handful of helpers allowing winter temperatures to kill off unsuspecting pests where the first crop was planted. Ultimately, farming is a job limited by available sunlight and heat. Innovations like these, however, stretch those resources for farmers, opening up more opportunities for income, but also for leveling out the workload so as not to be so dependent on summer production. And if this means more local produce in January, I think we can all appreciate winter farming’s new moment in the sun. Love the idea. Have spent some time on a farm in Washington state. Great article. We would love for this trend to continue.